Dr Veenanjani can perform all routine emergency procedures like suturing of lacerated wounds, nasogastric tube insertion, E.T tube insertion, minor I&D procedures, central lines and arterial lines. 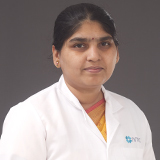 Dr. Veenanjani has attended many workshops, courses and conferences. The latest being the ESICM (European Society Of Intensive Care Medicine) conference in 2016. Dr. Veenanjani is well versed in English, Hindi, Telugu.